With the opening of the new Lava Pool at Disney's Polynesian Village Resort, Disney now has the opportunity to refurbish the leisure pool and surrounding area. The East Pool has recently closed in light of the construction project, and it is expected to reopen in early 2016 (no specific dates are available at this time). Some walkways near the construction area may also be unavailable during this time, but alternate paths will always be available and will be clearly marked. 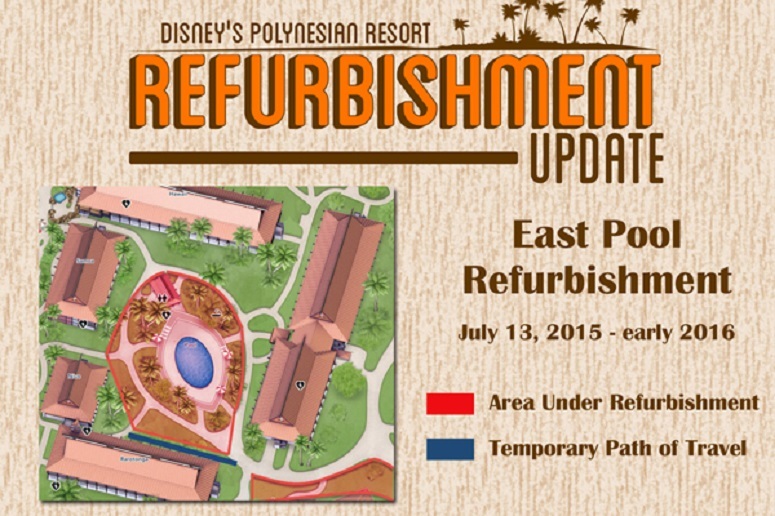 Guests may enjoy the Lava Pool and Kiki Tikis Splash play area as an alternative to the East Pool. At certain times of day, there may be some noise while work is being completed. Information is being placed in Guest rooms to notify Guest of the closure. Stay tuned here on Orlando Theme Park News for more updates about this refurbishment project. IMAGE: ©2015 Walt Disney World Resort. All Rights Reserved.